OnGuard bicycle and motorcycle locks offer ultimate, high, and basic security for students, families, and outdoor enthusiasts. More Lock. More Value. Less Worry. Offering bicycle and motorcycle u-locks, chains, cables, padlocks, disc locks and locking skewers. ONGUARD LOCKS SHOWN ON THE LATEST EPISODE OF NBC STUDIOS NEW COMEDY SUPERSTORE! OnGuard Locks wins the head-to-head contest against Link-Belt Excavators on the hit Nat Geo TV show, Showdown of the Unbeatables. Value: OnGuard bicycle, motorcycle, and powersports locks offer optimal security with the latest technological innovations, quality construction, and ease-of-use all at a great price. You'll enjoy all that the premium brands offer at a significant savings, giving you more for less. 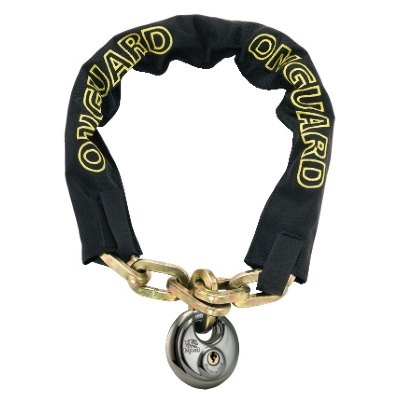 Great for commuters, students, and families, OnGuard delivers the meanest locks at the nicest price. Ease-of-Choice: OnGuard bicycle and motorcycle locks are categorized based on security level (Ultimate, High, and Basic) so that you can confidently choose the lock that best suits your needs. Security and Technology: Our latest bicycle and motorcycle locks feature the best security, materials, and technology we've ever had. See more about the latest innovations here. Service and Support: OnGuard locks are backed by the best sales and customer support team in the business. Use our Key-code registration service for secure key replacement, keyed alike options, comprehensive anti-theft programs, limited lifetime warranties and more. Get yourself a K-9 folding lock if you want an effective and easy-to-use lock.